For years, a group of friends would make an annual motorcycle trip from the Cumberlands to Cade’s Cove in the Smokey Mountains. Then one year, one of the riders asked “why do we go to Cade’s Cove when we live here”? That was an excellent question, there is even an area close by that strongly resembles Cade’s Cove, only this valley has a river that runs through it that is stocked with trout, and you aren’t choking on carbon monoxide from the thousands of cars that are passing through the Smokey Mountains. The local Cade’s Cove is known as Big Bottom; it is formed as the Caney Fork River exits the Cumberland Plateau into the Tennessee Valley. Big Bottom, the outcrop is visible. For years, I have looked at the mountains behind Big Bottom and asked how to get to a particular rock outcropping that is visible on the south side of the river. Every one who I’ve asked, had no idea. 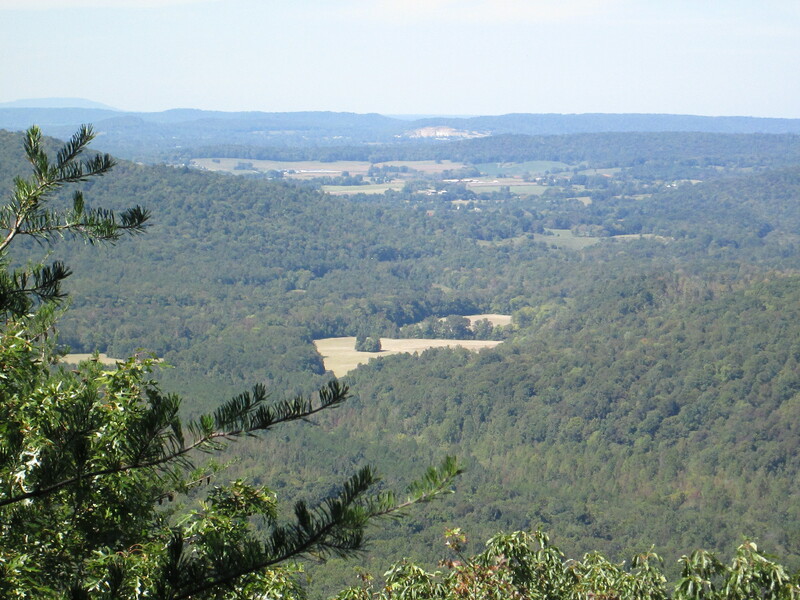 I’ve always enjoyed looking at this valley from the bottom, but I’ve craved seeing it from the top; not to mention, what a wonderful addition that overlook would make to the Mid Cumberland Trail. I knew that peering through the gap that allows the Caney Fork to pass into the flatter lands of the Tennessee Valley would be worth the adventure. So I plotted, and platted, and used google earth, and a compass, and tax maps, and a GPS to make my best guess of how to reach the top of that rock. In the back of my mind, I knew that a view like that would have a well-warn path leading straight to it – – boy was I wrong. The closest that I could drive, even in my 4×4 truck is in a community called Mooneyham, on a road called Graveyard Ridge Road. I had set the calculated coordinates in my GPS the night before, as I approached, I meandered up and down several logging roads watching the blip on the screen to optimize my hike. The closest point that I could park was 1.25 air-miles away. I left the truck, dashed into the brush and sometime after the GPS registered six miles, the batteries died; I was on my own. In places, the brush was so thick, I literally could not see twenty-five feet, and I had to pull out my hand-compass to make sure that I wasn’t walking in circles. When I finally got to the edge of the escarpment, the point where the top of the plateau plunges into the Caney Fork River Gorge, the pine thickets gave way to beautiful hardwoods. And I walked that edge, and I walked that edge, and I walked that edge. A few times, I came across paths, or four-wheeler trails, I was convinced that they would be headed to the overlook; I followed each to their end, and they didn’t. I finally found this vista, but it did not compute; I should see more vertical drop between me and the tree tops. 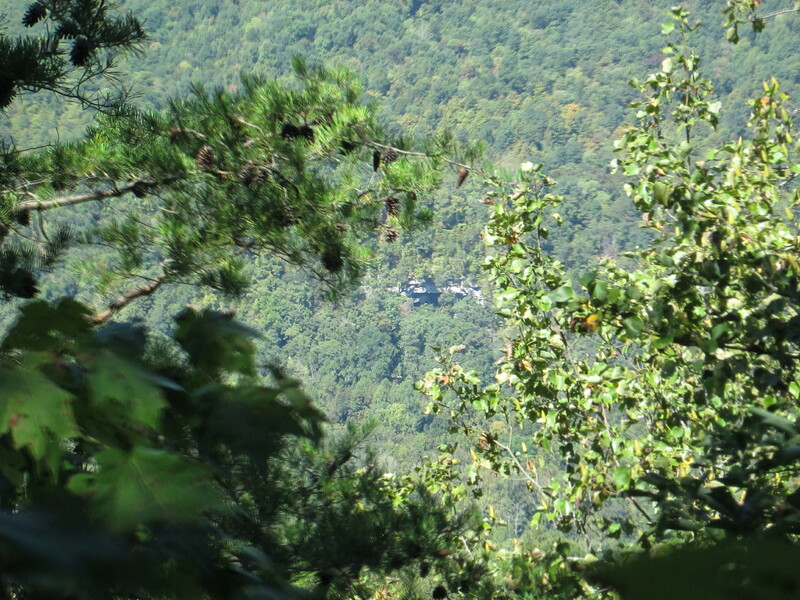 But none the less, I could see Big Bottom below, the rock quarry in Doyle, and if you look in the upper left corner of the photograph, I could see Short Mountain in the distance which would be at least 25 miles away. I doubt that I am the only human being who has ever stood in that spot, but judging from the fragile, inches-thick moss at my feet; I suspect that it had been a long long time since it was disturbed. 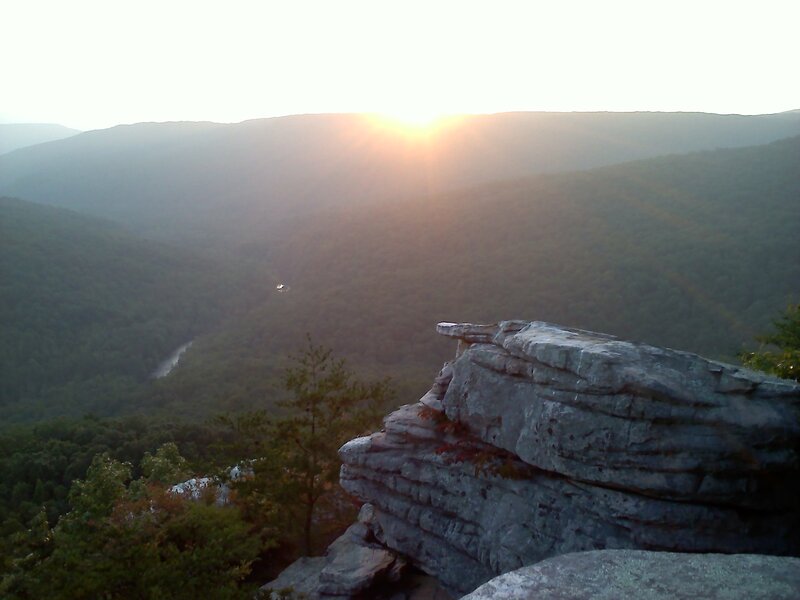 And as much as I hate to acknowledge it, when I finally got back to my truck, and drove the twenty plus miles around to Big Bottom, I confirmed that the overlook that I was standing at, could not be the rock outcropping that I am searching for. 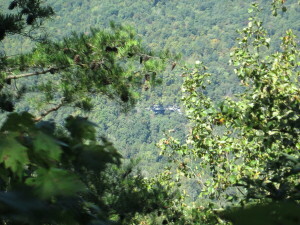 The bluff that I was standing on would be shielded from view from the valley by the trees that rise above the crest. My 6′ stature is the only reason that I could get the above photograph from that point. And to make matters worse, while I was walking that edge, at another point, I could peer through the trees and spotted yet another outcropping, on the far side of the river – – another quest for another day. 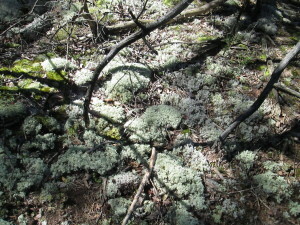 This fragile moss indicated how seldom this vista was visited. This entry was posted in Destination on September 27, 2014 by admin. My parents brought me here as a child. I had never seen water this color, or a place more beautiful. It stuck in my mind and as soon as I had a driver’s license I started returning; sometimes to fish, sometimes to swim, and sometimes just to sit and look. The generic name for this geologic feature is blue hole denoting an underwater spring. As you can see, the water close by is sort of green, but as you swim across the creek it becomes more blue and clear – – and much more cold. 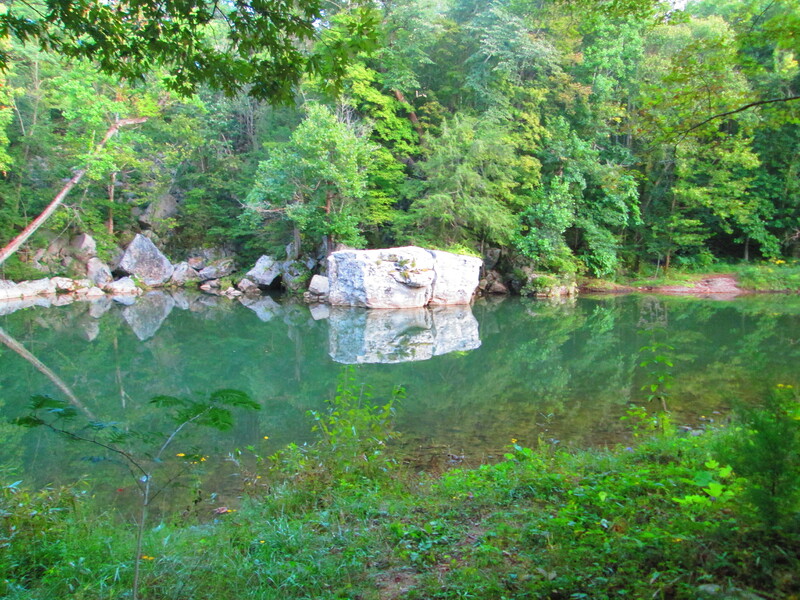 This blue hole occurs along Cane Creek in Van Buren County. This is the same Cane Creek that flows across Cane Creek Falls in Fall Creek Falls State Park. The stream doubles in volume at this confluence when the warmer greener water flowing along the western shore mingles with the cool dense resurgence from Camp’s Gulf Cave. To visit the Crusher Hole; from Hwy 111, turn east on Hwy 285 and go 6.4 miles. When you get to the bridge over Cane Creek, the property is on the left. You may access it through the field, or cross the bridge and turn left on Owl Hole Road. Trout love it here – – I do too. This entry was posted in Destination on September 25, 2014 by admin. The land of falling water, the western edge of the Cumberland Plateau. Four counties, seventy-two waterfalls. This area is home to the highest waterfall in the eastern United States; but vertical drop doesn’t necessarily determine spectacular. Sometimes the beauty of a falls may be the clarity of the water, sometimes it may be the surrounding landscape, sometimes the sound is so unique you can enjoy it with your eyes closed, in this case all of the last three criterion apply. Nestled on the edge of Fall Creek Falls State Park, the discovery of this falls was so recent; it doesn’t yet show up as a Tennessee landform. 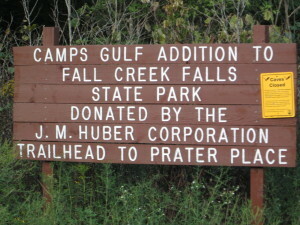 The falls marks the end of the Prater Place Trail. Though the sign at the trail head says it’s 2.7 miles; two GPS’ indicate it is 3.67 miles each way with a 500′ elevation change. The trail takes you near one of my favorite caves, Camps Gulf; and the Prater home place – – how did I settler eek out a living here? As you hike the trail, note that the stream bed may be dry. During rainy weather, it can swell substantially as water will dump out of the cave systems into this creek. But on a typical summer’s day, you may be discouraged – – don’t be. Somewhere, between Cane Creek and the falls the water disappears. Die tracing shows it winds up in Camps Gulf Cave only to flow out a few miles away at the Crusher Hole. 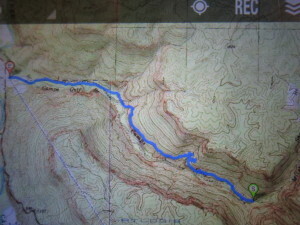 To get to the trail, from Hwy 111, head east on 285 6.4 miles. When you cross the Cane Creek bridge; the trail parking lot will be the second road on the left. It’s worth the drive and the hike. This entry was posted in Destination on September 19, 2014 by admin. Welch’s Point. Note the gap between the main rock and the boulder. One of the most under-recognized gifts that the state of Tennessee has ever received was in the form of a land gift from Bridgestone Firestone Corporation. 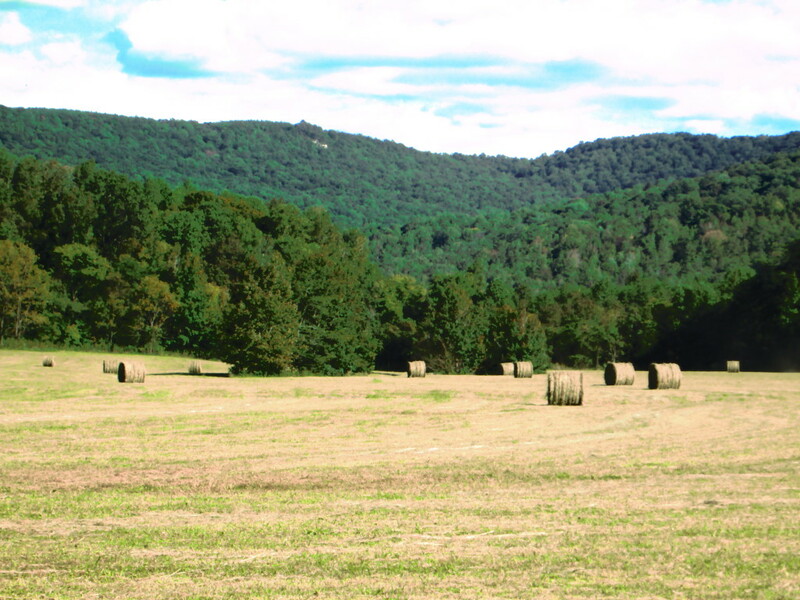 Located near Sparta TN this 11,000 acres represents the largest acquisition of land by the state of Tennessee since the Great Smokey Mountains. The property includes miles of headwaters of the Caney Fork River where the whitewater is so good people come form Asia and Europe to run the Class V. There is an abundance of caves, waterfalls, and scenic overlooks like nowhere else on the Cumberland Plateau. The property totally surrounds two other parcels which have since become state-owned. One is Virgin Falls, the second is known as Welch’s Point. This adventure took place at Welch’s Point during September’s Harvest Moon. Anyone familiar with Welch’s Point will appreciate this. There is a gap at Welch’s Point that gets you out to a big boulder which gives optimum eastward viewing. I went out there that evening in hopes of getting pictures of the Harvest Moon rising over Scott’s Gulf. I left my pack (including flashlight) on the main rock, and meandered down through the weeds to climb up on the big boulder. It got darker and darker, still no moon. Finally two friends texted me pictures of the moon from other locations and it became obvious that the moon rise was farther north and obscured by the trees. Thank goodness I had my hiking stick, there was still enough light to make out the light stone sides of the crevasse from the dark ground but that was it. Just in case, I was sweeping my walking stick ahead of me before I stepped. I hit what felt like a limp vine and I heard it. The other end of the crevasse is vertical going 100′ down. The sides going up at the highest point are maybe 15’; the adrenaline was like a shot of youth; for a moment my legs were 20 years younger, and my arms were about five feet longer, and I did what I’ve not done in a long long time. I went vertical. I literally went straight up the rock face, grabbed my flashlight from my pack and returned to the edge zooming in on this angry noise-maker with my camera. Two months ago, I had hiked to the same spot to get pictures of Scott’s Gulf under a bright full moon. On my return, I caught a glimpse of what appeared to be a bent stick in the road ahead. When I got closer, I noted that it was bent the other way. That time it was copperhead, but I could easily see to maneuver around it. I have probably hiked out to Welch’s point more than I have any other trail. I feel as safe there as I do in my own home. Here is my word of caution. No matter how familiar we are with our surroundings; wildlife is a variable that we often dismiss. 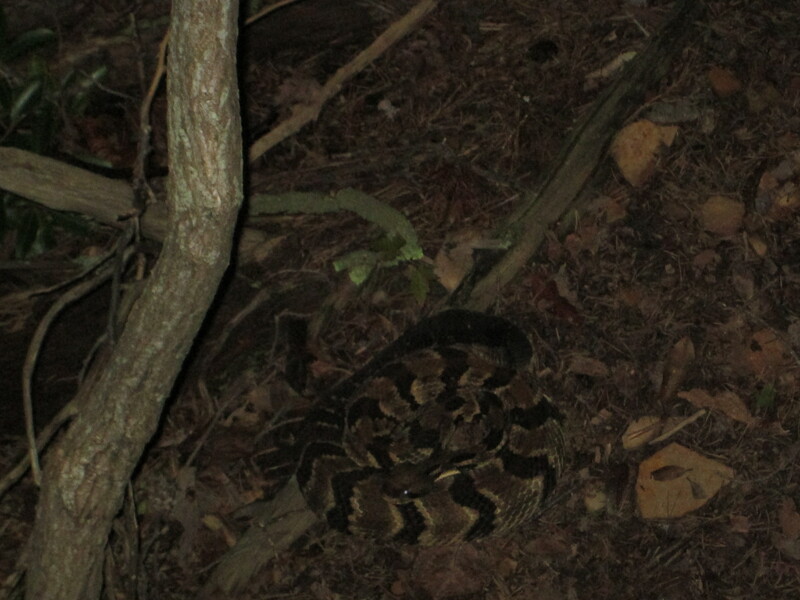 In the case of the Bridgestone Firestone Centennial Wilderness, I have heard more reports of encounters with venomous snakes this year than all other years combined. I am sure that is partially because of the growing popularity of the area; I strongly suspect that it is also due to an increase in these reptiles as well. Rattlesnakes have been on the endangered-species list for decades, we might be seeing signs that they have rebounded. When we are in the woods, especially after dark, we are in their home – – be wary – – but isn’t that part of the thrill of being outdoors. This entry was posted in Destination on September 11, 2014 by admin. 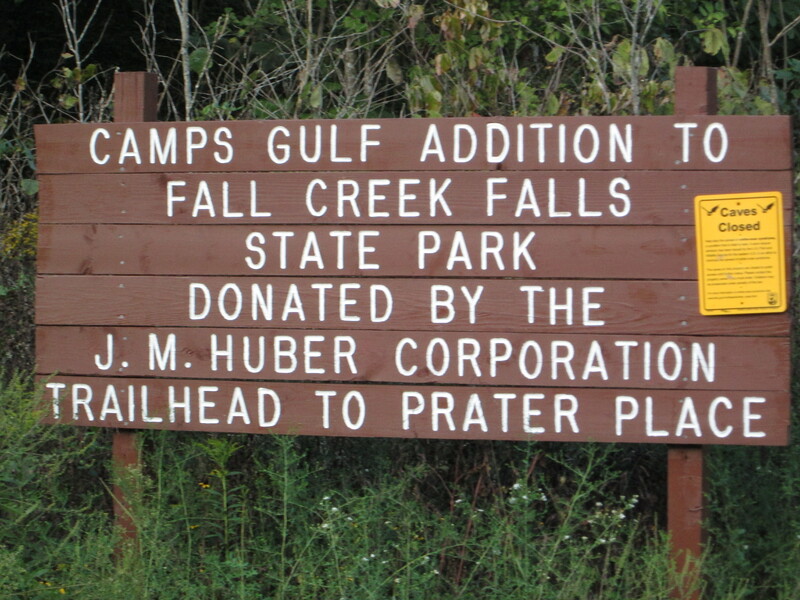 Imagine a loop trail where you can walk in near Sparta Tennessee, and walk out at Fall Creek Falls State Park and then back down Bee Creek into the Caney Fork River Gorge and return to your car via Virgin Falls. 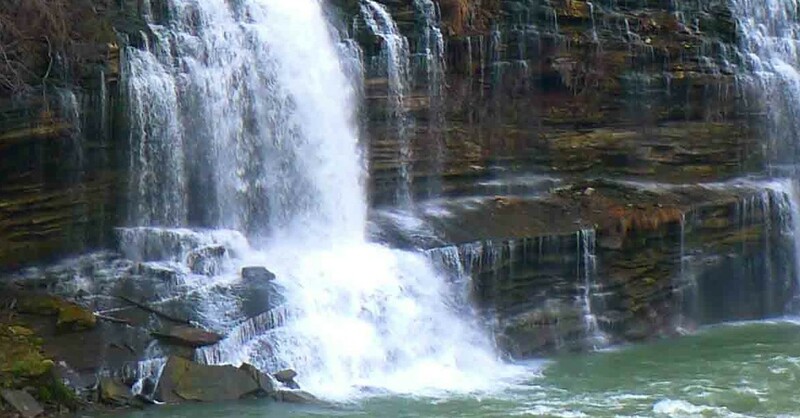 The total trail system will be over sixty miles long and have more waterfalls, scenic overlooks, and caves per mile than anywhere else in the United States. 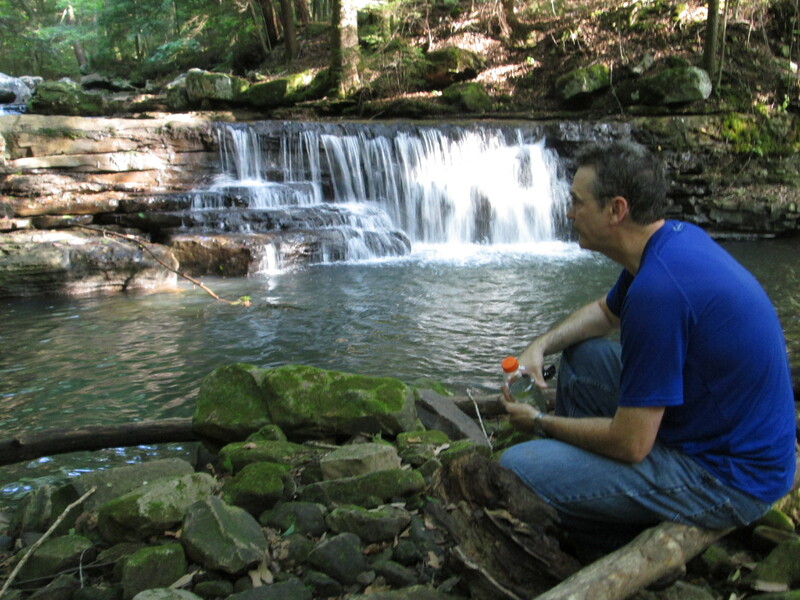 The Mid-Cumberland Recreation Area is becoming a reality. 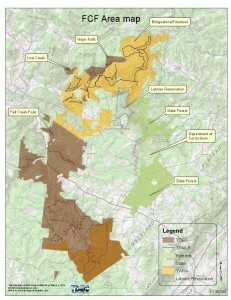 Beginning with what might be the most under-recognized gift that the state of Tennessee has ever received, the Bridgestone / Firestone Bicentennial Wilderness at the north end, and continuing to the most popular state park in Tennessee; Fall Creek Falls, there is now enough state-owned property in between to make this work. The friends of the Mid-Cumberland Recreation Area meet the fourth Monday of every even-numbered month. We need numbers. We need names, and email addresses for people who don’t mind letting their representatives know that they are excited about this endeavor. 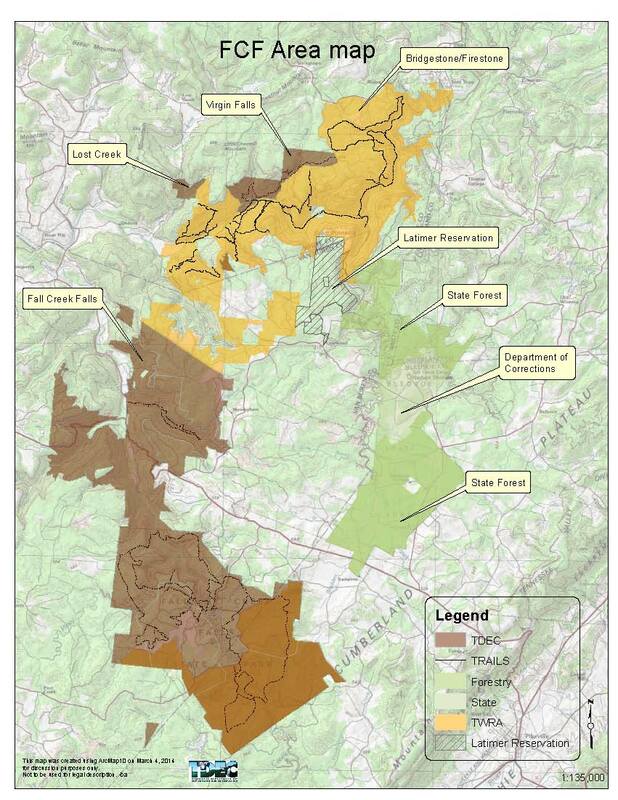 We need avid hikers, cavers, bird-watchers, and paddlers to help plan. Sometimes, we’ll even need a few strong backs to help build and maintain the trail. And last, and perhaps should have been first, we need to know as many obscure features in the area that should be accessible along this trek. If you know locals, hunters, loggers, fishermen, etc. ; ask them to share their knowledge and history of the area and report it back to this site. If coordinates, maps or written directions can be provided; that is a plus, and from time to time a Mid-Cumberland t-shirt or cap will be awarded to those providing the data. We would also like to know the treasures that lie in adjoining and nearby properties as well. There is a possibility that we can acquire those lands and add them into this project. When we are done, we will have one of the most admired wilderness trail systems anywhere, right here in our own back yards. There will be over twice as many miles of trail, than in Zion National Park, with more biodiversity than the Smokey Mountains. Time to stock up on Dr. Shoals.